Finally Sees Light Of Day! 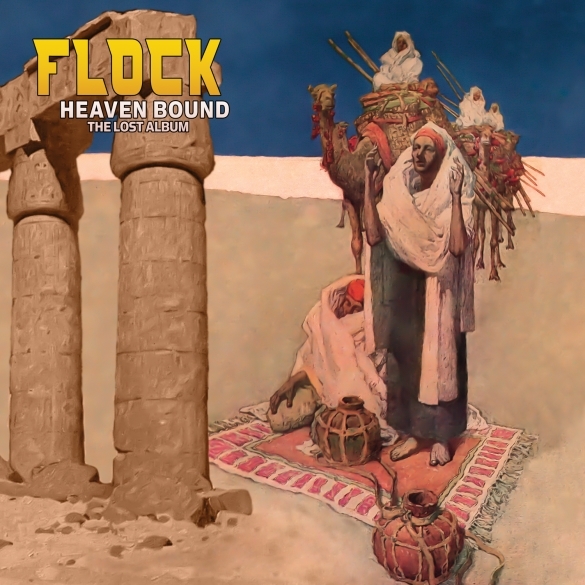 Los Angeles, CA – Nearly lost to the sands of time, a recently discovered set of vintage ‘70s recordings from Chicago-based jazz-rock ensemble The Flock will finally be released as Heaven Bound – The Lost Album on July 22 through Cleopatra Records imprint Purple Pyramid! These never-before-released recordings feature founding Flock members Fred Glickstein (vocals, guitar), Ron Karpman (drums), and Jerry Smith (bass) on what could have been the band’s magnificent fourth album. The Flock were one of the most adventurous bands in the jazz/fusion music scene of the ‘70s alongside Chicago and Blood Sweat & Tears, well known for featuring violin great Jerry Goodman (later of Mahavishnu Orchestra) on the band’s first two Columbia Records albums – 1969’s self-titled debut and 1970’s Dinosaur Swamps. After Goodman left, a reformed Flock released Inside Out on Mercury Records in 1975, and though the band was dropped from the label shortly thereafter, Glickstein and Karpman continued to write and record together, with Smith popping in every now and again, in anticipation of a new recording contract. No such deal ever materialized, however, and so those recordings were shelved away for safe keeping, never released…until now!